I recently returned from my latest WDW trip and wanted to write up some memories of the trip while it was still fresh in my mind. The main purpose of this trip was to run in the Expedition Everest Challenge (EEC). I’ve always thought this looked like an interesting race but the timing has never worked out for me to run it. When it was announced that 2015 would be final year for the EEC, I committed right away to attend. Several of my friends were also planning to be there the same week — one for the EEC, another for her birthday — so I knew it would be a fun week to be there. And the Epcot Flower and Garden Festival happening at the same time was another plus, although as it turned out we only spent one day at Epcot and didn’t see as much of that as we might have liked. I knew from talking to friends who had run the EEC before that there wasn’t really a race expo — but I still wasn’t prepared for just how scaled down this event would be. First of all, final race instructions didn’t even arrive until I was in Florida, so I wasn’t really even sure what was going to be happening when. When I did receive the final race instructions email, I learned that the location for the registration was the Animal Kingdom parking lot. When we arrived at the park, directions were non-existent — I never saw a single sign directing runners how to get to the registration location. Since the registration didn’t open until noon our plan was to spend the morning in the Animal Kingdom then pick up my bib and other materials on the way out. As we were trying to get into the park there was all “all stop” on the trams as a guest was walking down the tram-only roadway trying to find a way through the barriers and into the registration area. Partly — OK, mostly — his fault, but again the complete lack of directions on how to get to the tents didn’t help. (When we exited the park and were ready to head over to registration, we had to ask a cast member the best way to get there as I never saw a directional sign. It was definitely arranged in such a way that they clearly expected you to ride the tram to the front entrance and then walk back to the tents — but this was unclear from the parking lot and it looked like the trams would take you away from where you needed to be). The registration area was just a big tent; you went into one side to turn in your waiver and get your race packet (bib, wristband for the after party) and then to the other side to get your race shirt and a plastic bag for the bag check. It was by far the quickest registration I’ve ever been through for a runDisney event – I was probably out of there in under 10 minutes. There was no official runDisney merchandise. New Balance had a booth to sell this year’s monochrome shoes (so glad I got the 2014 version) and Fit2Run had a booth there as well. (I think there was one other tent but can’t recall which company it was for). That was the totality of the ‘expo’; I didn’t make any stops other than the registration tent and then we headed back to the car to spend the rest of the day in another park. On race night, I had dinner with friends at Jiko and then made the short drive over to the Animal Kingdom parking lot. We arrived about 8:45 for a 10 p.m. start, and had a chance to do some visiting before time to head into the corrals. I was in corral I (J was the last, so I’m definitely a back-of-the-pack run/walker). The first corral started at 10, and I believe it was about 10:40 when our corral was scheduled to start. Unlike other runDisney starts there were no fireworks as each corral started — I’m guessing that this is out of consideration for the animals rather than due to the relatively small scale of the race. From the corral I watched the other groups start one by one. Because of the way the corrals were arranged we didn’t move from our assembly spot until we were the next corral to go. Once we were up and in position, it was a pretty quick countdown to our start … and that’s where I’ll pick up the story in the next post. 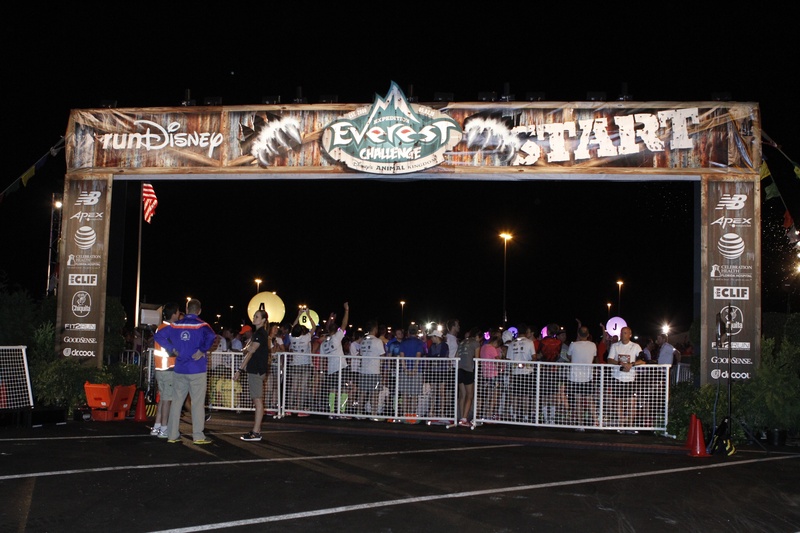 This entry was posted in Disney, runDisney, Running. Bookmark the permalink.